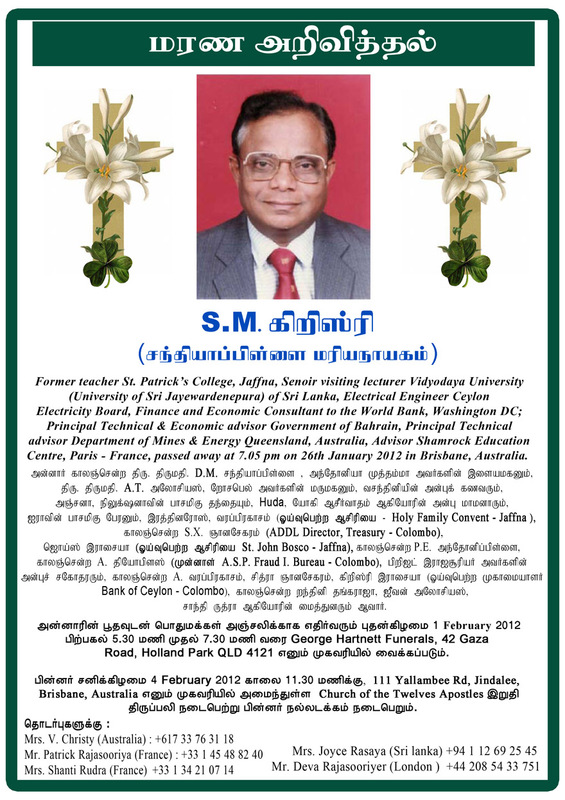 Former teacher St. Patrick’s College, Jaffna, Senior visiting lecturer Vidyodaya University (University of Sri Jayewardenepura) of Sri Lanka, Electrical Engineer Ceylon Electricity Board, Finance and Economic Consultant to the World Bank, Washington DC; Principal Technical & Economic Advisor Government of Bahrain, Principal Technical Advisor Department of Mines & Energy Queensland, Australia; passed away at 7.05 pm on 26th January 2012 in Brisbane, Australia. Beloved husband of Jeanette Vasanthini, brother of Ratnarose Varapragasam, S. X. Gnanasegeram (dec’d), Joyce Rasaiya, Antonypillai (dec’d), Theophilus (dec’d) and Bridget Rajasooriyer, brother-in-law of A. Varapragasam (dec’d), Chithra Gnanasegeram, Christy Rasaiya, Ranthini (dec’d) & Thangarajah, Joe Aloysius & Lalitha (Canada) and Shanthini & Rudra (France), devoted father of Sahaniya and Tina, father-in-law of Huda and Yogi Aseervatham, precious grandfather to Ayra, dedicated and admired teacher and mentor to many. Family and friends of Christy respectfully invite to attend his funeral services at the Church of the Twelve Apostles,111 Yallambee Road, Jindalee, Brisbane, Australia on Saturday 4th February 2012 at 11:30 a.m. I join with so many others who knew Mr. Christy in offering their deepest sympathy on his passing away. Mr. Christy is not only a Physics teacher but also a guide to so many of us, his students. In teaching you cannot see the fruit of a day's work. It is invisible and remains so, for many years , maybe even after his passing away. I personally took liking to him don't know because of his person or because of physics how ever he was a role model a fine loveable person.